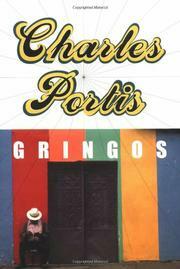 Portis's latest combines the same hard-boiled goofiness and swift storytelling that make his earlier books (Masters of Atlantis, 1985, etc. ), so enjoyably original. This one's a sweaty intrigue, set south of the border, that toys with cosmic themes, only to reduce them to their deservedly comic size. The expatriate community living near the Yucatan includes all kinds of kooks, dypsos, and schemers. The only sane and stable gringo here seems to be the somewhat mysterious narrator, Jimmy Burns, a self-described "lugubrious bore" who fancies himself "the very picture of an American idler in Mexico." Though Jimmy's past as a looter of antiquities ("recovery work") continually catches up with him, he now survives on odd jobs and light hauling. But much like Travis McGee, he also salvages lives, especially the many good-hearted, empty-headed spiritual pilgrims who hope to find the mysteries of the universe revealed among the Mayan ruins. Burns's irregular friends include Louise and Rudy Kurle, two ufologists interested in discovering evidence of prehistoric space travel; Emmett, the often-married old-timer desperately seeking a cure for his physical ailments; Minim, a retired pro bowler who now writes sports poems; a few psycho vets; and Doc Flandin, a wealthy old Mayanist still at work on his masterpiece, a survey of Meso-American civilization. When a lot of New Age hippies as well as some nasty dopers start bumming through town, Burns gets wind of a secretive ceremony to be held at a remote ruin. Is it just more silly talk of harmonic convergence? Of a visit from the little people? Or is it to be a scene of sacrificial violence? Always on the look-out for US runaways, Burns spots one in the company of an evil ex-con who leads a bunch of Mansonesque crazies toward the ancient site. Burns's arrival down river not only spoils the wacky celebration, but he also saves a few lives in a notvery-funny bloodbath. He even solves the mystery of the sudden surge of local madness, all of it traceable to a few articles in an obscure UFO bulletin. The double-talk of the cultists is expertly filtered through Portis's lean and muscular prose, and the plot's as tight as a blood-swollen tick. All in all, totally boss fiction.